So yes, I’m jaded, but I don’t think I have a closed mind: if these are wonderful, I’ll be thrilled. That's me, commenting on the post that announced the then-upcoming Collection Extraordinaire from Van Cleef & Arpels. That article elicited a number of skeptical comments, including my own, about the glut of multi-scent luxury perfume launches — many of which turn out to be less interesting than the prices and the fancy packaging would suggest — and then a discussion about whether some of us were perhaps a bit too jaded. I might be too jaded, who knows? It doesn't seem to me to be an important issue: I say what I like in the comments, but I go right on smelling and looking for beauty regardless. And whatever my original suspicions, I did keep an open mind when I smelled the Collection Extraordinaire, and yes, I'm thrilled. This is a lovely collection. All six are worth smelling, and one, Bois d'Iris, captured my heart thoroughly enough that I laid out the $185 (!!) for it on the spot, thereby blowing my third quarter damage tally, which up until then had been a very gratifying zero. So. This is not the sweet, leathery-chocolate iris of Dior Homme, nor is it the cold swirling roots of Serge Lutens Iris Silver Mist, nor is it the elegant powder of Frederic Malle Iris Poudre. There isn't the earthiness of The Different Company's Bois d'Iris, nor the metallic transparency of Hermès Hiris. It isn't brisk and outdoorsy like Divine L'Homme de Coeur, or delicate like Acqua di Parma Iris Nobile Eau de Toilette. And yes, it's minimalist, but not nearly so much so as Chanel's 28 La Pausa. Bois d'Iris is, as described, a woody iris; it did not call up driftwood in the same immediately obvious sense as say, Andrée Putman Préparation Parfumée, but once I read the description, it all fit. The opening is citrus-y iris, lightly sweetened, rather creamy, and peppery-spicy with something that smells almost like clove (the notes: sweet notes, frankincense, iris, driftwood, vetiver, ambergris, labdanum, myrrh, vanilla). It gets sweeter and more vanillic as it dries down, and the spicy notes fade, but the whole thing is layered over a very dry, almost-smoky pale wood, so to my nose, it never gets to the foody stage, and the sweetness in the later stages is from the myrrh as much as the vanilla. The dry down is powdery, but there's nothing frou-frou or girly about it. The amber recalls the salty, almost-transparent treatment of Hermès Eau des Merveilles, and it adds an airiness to the fragrance, although it isn't otherwise what I'd call a sheer fragrance. On the other hand, it isn't heavy either: several good sprays make it though the day, but near the end, it's close to the skin: if you're looking for something with impressive sillage, you might need to look elsewhere. Is it worth $185? I have no idea. It's awfully expensive, but I don't find it as ridiculous as the $165 they were asking for the recent Sisley cologne trio, and I've paid as much for several fragrances from Hermès. But $150 makes me gulp, and $185 makes me gulp even harder. I don't like spending that kind of money on perfume, but I'm a sucker for a good iris. 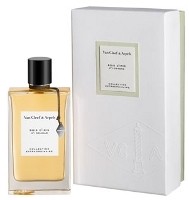 Van Cleef & Arpels Bois d'Iris is part of the Collection Extraordinaire, and is $185 for 75 ml. In the US, it can currently be found at Neiman Marcus and at Van Cleef & Arpels stores. According to Women's Wear Daily, the Van Cleef & Arpels boutiques will also carry a limited edition coffret with all six fragrances: if anyone knows what the size of those bottles is, please comment! 1. I'm not sure, but I think Van Cleef & Arpels is marketing Bois d'Iris as feminine, so I'm basing that on my own nose. The other four scents are more conventionally feminine florals, although of course that doesn't mean men can't wear them. Note: image is Driftwood Pattern 1 [cropped] by PlassPhoto at flickr; some rights reserved. I’ll have to check for samples….TPC have it yet? sigh….you know I’m gonna like it. And the perfume budget has already been blasted to smithereens this quarter…more sighing…. oh Boo—- next quarter IS the quarter I’m lamenting!!! wahhhhh! I really should have waited & bought this in October…it would have been so nice to have 1 quarter where I had bought NADA! My thought exactly! Then I brought 2. )XD Thankfully I resisted any scented splurge but unfortunately I got into collecting fancy coloured diamonds )XD Ironic how things work out sometimes. You know, you can beg samples at Neiman Marcus — they do have them, and I’ve seen lots of sample sets on eBay. Or TPC probably does have it. I will have to check TPC —samples are pretty much it for the next couple of months….the Guerlain Boutique is the root of all evil…. Ooh… now I definitely need to go to NM and Saks on a sniffing expedition this weekend. Ever since reading the reviews of this collection on other blogs, I’ve been salivating over them, but I can’t imagine spending the $185 (times 6) – especially since this quarter’s budget is blown all to heck. I have the feeling that even it I hit the lottery, I’d be in the poorhouse in no time flat. I really would like to find out about the coffret — wouldn’t it be lovely if it was 15 ml bottles? All swappable? But not likely. Yes – the coffret would be lovely. Unfortunately, it doesn’t look like there is a boutique near me – although at least they should be willing to ship, right? You’d think, but who knows. This collection isn’t on the VCA website at all, at least not yet. I actually just bought Perfume at Neiman Marcus online, and with it comes a full set of samples of VC&A! It’s like a coffret of small vials with all six scents! I’m so excited to smell all of them, esp. Bois D’Iris. Oh, dear. Now I want. Every word is a magnet. $185. Oh, dear. Worth a try, at least — and do note that I said a “must try” for iris fiends, not necessarily a “must have” — don’t think everyone on earth will love it. Good to know–I am an iris fiend, too! Wow, it really sounds wonderful! Dying to try it now. $185, yes, gulp … but if you truly love it, worth it when you think about how long a bottle lasts. HA…in my case, that’s a disincentive, because in all truth I’ll never even make a dent in it given how much perfume I have already! True enough … seems like I’ve barely made a dent even in my absolute favorites because I have so much! Exactly. I really ought to stop buying altogether. Sounds really lovely, Robin (especially with that salty ambergris… I expect Haunani any minute now). Nice review. And yes, as jaded as we all get (and as tired as we get of the sheer number of launches), it’s of course always possible to be wowed and bowled over by a work of beauty. Case in point is me wearing my decant of Epic Woman today. I’m also an iris lover, but wow, yes, $185 for 75ml is up there! I almost just bought a sampler set of all six scents, but I’ll wait… if this iris (or the lily) crosses my path at some point, so be it. This, has however, finally gotten me moving and I just took steps to get decants of Dior Homme and Divine L’Homme de Coeur. And of course I still very much love that *other* Bois d’Iris. I also have to say, in terms of recent sniffage, that DelRae Mythique is absolutely exquisite. For my money, I might save up for that. It’s unbelievable. I just realized: I CAN have enough vetivers with fewer than a handful, but I don’t mind having more than a handful of iris scents! And I have not tried Mythique, or Epic Woman! So they’re wonderful? both are lovely….I’m wearing Epic today too….SNIFFFFFFFFF! ahhhhh. I happen to know that the lady Joe and I got our decants from is looking to split up another bottle…..
As they say, your mileage may vary, but I think both are great. Oh, and I mentioned Mythique because it’s an iris, if that wasn’t clear. I love it. I may need to scheme to get a decant. I got it, although before you said that I’d already forgotten it was an iris. I think I have a sample on the way! Ok, wearing the Mythique. Should keep my mouth shut since I’ve only been wearing it all of 20 minutes, but initial reaction is that this is really nicely done but is too delicate/pretty for my tastes (I am not a big fan of peony) & I like the VCA much, much better. Very cool… glad you got to test and post back here. Now I’m curious to do a side by side. Wearing DS Durga Orris Root today to get my iris fix. Oh, didn’t try the DS & Durga! Hrm. Thought I might have sent you a sample, but maybe not! R, is it better to spray these? I am asking because, I actually dabbed my sample of Bois d’Iris on the back of my hand yesterday afternoon (ha, ha,-great minds think alike! ), but I did not like it that much. I also dabbed my sample of the Gardenia Petale on the back of my other hand, and that one sort of faded. Sigh! I did, however, spray the testers of the Lys Carmin and Muguet Blanc when I visited NM a few weeks ago, and I thought they were lovely, but I can’t remember which one I liked better. These have been under the radar since they debuted, but I am glad that you, Patty and Octavian are now reviewing them. They are definitely worth a test or two…or three! Wonder what the Cartier Collection will smell like? Bois d’Iris is much quieter than the florals, I think — it definitely does better sprayed, and sprayed lavishly (although for me, lavishly means 2-3 sprays instead of 1). I thought all the florals were pretty, but none of them were instant love. Need to give them more time. VCA seems to want these under the radar — they apparently aren’t planning to spend a dime on advertising, and unlike, say, Chanel w/ the Exclusifs, I haven’t seen much coverage in the magazines or interviews with the perfumers, etc. But do wonder if they’ll be more widely distributed eventually? And I’m curious about the Cartiers too…Mathilde Laurent does nice work. But have to add…just checked, the Cartiers will be $255 for 75 ml. I’m thinking that’s a threshold I might not be willing to cross! Bottles are lovely though. Plus, they’ll be at Saks so it will be ages before I smell them, probably. Did you say $255. for 75 ml? That’s pretty crazy. They really are targeting a niche market, especially in this economy. Still…I am curious to try them, especially if ML created them. This was one of the scents I tried last Saturday at Neiman’s. I loved it, trying not to go back and purchase. Have to keep the budget in check….. I am in major swoon mode over this smokey-woods & Chocolate-inspired scent by Guerlain. I don’t remember the name, unfortunately. Oh, could be. I didn’t love that one so I’m safe! Guet Apens/Attrape Coeur, maybe? Spiriteuse Double Vanille (smoky, but more boozy vanilla)? Iris Ganache sounds familiar, I know it wasn’t Spiriteuse Double Vanille. I’ve tried that one, and love it too. I may have to go back, someone save me from myself I’ll have to lock down the credit cards! just fantastic…..now I need to try Iris Ganache….that pretty much has to be what you’re thinking of Smokey, ganache is a creamy, chocolatey confection invented to make my behind more “substantial”. Guerlain? Smokey woods and cocolate? WHERE? WHAT? Which one? You mean the new one? Idylle. Or you mean Cologne 68? A high bottle with wooden cap? The other day I was thinking that I had no idea what an iris actually smelled like, so the entire category of iris scents is totally lost on me. LOL maybe I should leave it at that — it would help the checking account! LOL…not a bad idea to stay in ignorance, maybe! Congrats on your purchase, R! Sounds lovely, and I look forward to trying this collection. It ought to be “slap with a wet noodle for your purchase”, LOL…but thanks! Hey, if you get away with only $185 in a given quarter, you’re doing a heck of a lot better than several of us whom your blog seduces. HA! Yeah. I’ve done worse myself. Just want ONE quarter where I spend nothing! Nine days it it?? I think I may just make it…. if I can avoid going back to find the Guerlain chocolate thingie. I’d be happy with a quarter where all I spent was $185…..The CEO would be happy with that too….very happy. to have a $0 quarter I’d have to be incarcerated at the south pole. It’s SO true — I used to think $100 was expensive, now it’s no big deal, and yes, the Chanel Exclusifs seem like a bargain. Ooh, everyone is all aflutter about these! I can’t wait to try them. Too bad they aren’t sold near me – the only way I can try them is through TPC – and I have sworn to not purchase anything until December. No samples, no decants, no FB’s. Nothing!! At least that’s what I’m saying now We’ll see how the willpower holds out. Good for you — hold out, you can do it! It’ll still be here. Even the Angel Liqueur Parfum one? I’m not a huge Angel fan but I really liked that one and it’s a dreaded LE. That’s the one that might get through my willpower. Oh. That one. Well, that one might not be there. How lovely – to be pleasantly surprised by something when expectations are low. That doesn’t happen often enough. I love my decant of Epic Woman. I now own TWO bottles of the lovely and discontinued L’arte di Gucci. I have had tons of fun with all the little bottles of vintage classics I snagged off ebay this quarter. I’m seriously needing a small decant of SSS Tabac Aurea… (Daisy, you have a message! ) NOT BUYING ANY MORE PERFUME!!!! Until, um, next quarter or something. Ha ha. Oh, hey, that photo – your note says it’s driftwood, but it reminded me of hardened lava I saw in Hawaii. Fascinating image. Good for you! And yeah, it does look more like lava. I didn’t take the picture and don’t know what it is…might have been so-named only because it looked like driftwood? MISTYPED! I mean Lyric, not Epic… Daisy’s hyperventilating… “You bought Epic and you didn’t tell ME? ?” No, LYRIC was purchase #1 of the 3rd qtr. And now I desperately need a decant of Tabac Aurea. How long can I hold off?? Shelley is trying to get in touch with you re: Tabac Aurea…if you give me your permission, I’ll give her your email address. Should have said: she’s ScentSelf. Permission absolutely granted! And thanks. LOL! I WAS hyperventillating….I also emailed you to say basically what you said….how did you know? And you know how I love it when you cave! Ha — you like that I’m weak? I need to spend more time w/ the florals — not sure I”m going to love any of them, my initial reaction was pretty but not necessarily interesting or earth shattering — but overall, I think these were curated by someone with good taste. I prefer to think of it as “human”! I just love it when you fall hard for something. It’s so nice to think that someone as precise and “well-sniffed” as you is still susceptible to having her heart stolen away. Ok, I don’t even LIKE iris, and I want to try this. What is wrong with me?? I’ve been trying to control my visitations to this site for this exact reason–I have a tendency to go into lemming mode at the drop of a hat these days. I’d save money if I stayed off NST…but then I’d be sad. Aw. Hope you find another way to curb the lemmings! help… maybe I won’t like it? how does it compare to iris taïzo? Iris Fiend – reporting for duty. Wow, this sounds wonderful Robin – us iris fans are living vicariously through your $185. Salty iris sounds yummy. Would you liken it at all to Hermessence Paprika Brasil, another salty / iris kind of scent? Oh and one more thing: Am I the only one wondering why VC&A picked the same name for their fragrance, that The Different Company did? If I was Celine, I’d be pissed! You know, PB just never captured my attention in any way…it’s really the only Hermessence I have no real reaction to either way. This one is sweeter, and not as vegetal/earthy. I also want to say “not so wan”, but if you love PB you probably don’t find it wan! I don’t know what happened but when registering usually the company name forms a part of the name as well, like if I recall correctly “Chanel Allure” was filed in the registrar instead of just “Allure”. Likewise “Chanel Chance” was registered even though Geoffrey Beene Chance was released in 1994. Having not met Céline nor Jean-Claude Ellena (TDC Bois d’Iris is his composition, after all) I don’t know what they would have thought, but in the fragrance industry in general people sometimes simply take the “imitation is the most sincere form of flattery” approach because, heck, such situation happens in one form or another–this wasn’t the first time nor the last time. I mean, it’s either this or the legal route–and the legal route is never pretty. Especially given Jean-Claude got his break with VC&A First something tells me aside from a few murmurs behinds closed doors it would be business as usual for both parties. yup, I think you are spot-on. Thanks! I just want to share a behind-the-scene story as a contrast: in the States I think individual names will have to be registered (haven’t studied American business law so can’t cite specific regulations) and I’ve heard that in the 90s Calvin Klein (the brand) picked “Intuition” as the name–problem: some small player owns the name (not EL then). So CK wanted to buy the right. The person asked for $1 million. CK bulked and chose to walk: “Contradiction” was chosen instead. Now, obviously Estée Lauder launched “Intuition” later so I have no idea what happened on that front. (Ms. Cathy Newman documented the Calvin Klein story in “Perfume: The Art and Science of Scent”.) So I can’t stress that it’s up to the individual company to deal with the situation: sure, I think in North America legal action is the obvious choice but sometimes it’s not that cut and dry when people know each other and all talk behind closed doors like in Paris. Wow…this sounds really wonderful! I’ve gotta go sniff this. I do like Iris…but haven’t found “THE” iris. Well , I LOVE SL ISM but that is out of my league right now. In the third paragraph you wrote that this is one of TWO unisex in the collection, but in closing you said they are marketing this as fem? Not that THAT’S ever stopped me. HA! To me, 2 of them are unisex and this is one of those…but I think VCA is marketing all of them but the cologne to women. Not sure! I am dubious that it’s pegged as a masculine, although that might mean it’s unisex (Osmoz doesn’t have a unisex category so they usually put them in masculine). But WWD says it’s a feminine. Who knows! Oh, but what a shame! and even if you do walk by, it does need some courage to open the rather forbidding-looking door of the shop, which seems to be closed… try again next time you’re in Paris! Yes, will try again–Serge Lutens and Guerlain (later that day I tried visiting the Champs-Élysées store but, alas, the boutique was closed at 4:30 pm that day…I arrived 10 minutes too late). Better luck next time I suppose! Okay, I need to go sniff out this collection. I am still not sure I actually like iris but I am working through them. On a sad note, I got my first paycheck, but then my debit card number was used for a $1500 fraudulent purchase. Sigh. I was all ready to send for some Balkis…. Oh, I’m so sorry! They have to give it all back, don’t they? Yeah – they issue a provisional credit while they investigate – just takes a few days. Bleah. Tama, that’s terrible. Another reason not to get a debit card. Is there anything to be done for you? A very nice SA gave me a sample and I had the same reaction–I shelled out the $185 on the spot, but wore the samples first. Surprisingly, the stuff vanishes off me in minutes. Sisely, however, haunts me for hours. Just a different chemistry, I guess. I filed a claim and hope to have a provisional credit applied soon while they investigate. What was kind of cool was that the company the order was placed with was a place my grandma had worked many years ago – I mentioned that when I told them of the bogus order, and got a call from the owner, who reminisced about my family. It was really sweet – he gave me his email so I caught him up. I might be out of place here, but I was curious about the gardenia petale… Octavian makes it sound wonderful and I get crazy over simple and beautifully executed white flowers. (beyond love, looking at you, ma cherie). On the other hand, iris focused fragrances don’t seem to agree with me…. Even if they have a chunk of wood (in the name or in the notes) to lure me in!! As with vanilla, I learned my lesson the hard way with iris; my motto is: “tuck your ears (and nose) and DON’T try on skin”!!! $$$ saved, I suppose ;)! I can’t really comment on the gardenia…so far, have only tried that one on paper. I’ll get to them all eventually! But of course, enjoy your BdI first! Lucky me, Iris leaves me cold but my friend is getting crazy, she called me to tell about the review two days ago *lol* she was craving the LE Iris Pallida from L’Artisan, (my fault – and 250 Euro!) and she tried SL Silver Mist which is the worst thing I’ve ever smelled (nearly…). Iris is not for me. Okay, on an iris tangent… so I was in the grocery and they had irises by the checkouts. I smelled every iris I could kind of bend down towards without losing my place in line (looking like a real weirdo in the process btw! ), and what I got was a kind of faint plant-y smell, slightly cool and… polleny? Is that the scent associated with iris? (Which is different from orris?) They were in bouquets so I’m sure it’s a little muddled. It did kinda smell like the brief sniff I had of Mythique a few days earlier — but I don’t know if that’s even a useful point of comparison. The iris in perfumery is from the aged/treated root, totally different from the flower. Sniffing trip has been planned – my bff and I are heading to NM, Saks, and Nordies on Friday to sniff and beg for samples. I’m hoping that I can score samples of all six – even if it means that I have to buy some Prada Infusion d’Iris, L’Eau Ambree, or the Alien Liqueur to get them. All of them are on my list, I just hadn’t decided to break down and get them yet – or I could finally buy the Mitsouko on my list. If you buy something at NM, they’ll give you a leopard print tote bag. I passed, I’ve got a gajillion tote bags. Ha ha – me, too and I either own or am not interested in the 3 perfume samples that they’re offering in it. I just want the VCA collection samples – if I get the tote, I guess I’ll look for someone who wants it. Thanks for peaking my interest Robin. I hope to get to NM soon and will do my best to schmooze a sample or 2 out of an SA. Wish me luck! Update: when I got my samples I sniffed all six perfumes out of the little vials, starting from GP and ending with BDI. All the flowers smelled pretty, but maybe too much so that I wasn’t tempted to try them on skin. GP, in particular, seemed to have an acquatic thing like the new goutal, which scared me off. But BdI, was so beautiful I wish I hadn’t said anything about iris before. I found it difficult to go through the very powdery-iris of the first hour or so (just a matter of personal taste, because it smelled good nonetheless), but the woody-resinous dry-down was simply gorgeous. I liked that stage so much that I wore BDI the whole week-end. I don’t know if this is FBW for me, because I find the sweet powdery iris quite challenging, reminding me of expensive talcum powder, but the resinous heaven it progresses to is a stunner!! Robin this is fantastic! I received my sample today (along with the rest of the new extraordinary collection) and was really impressed. Initially it reminded me of Iris Pallida- although less sweet and with a much stronger clean smoky kind of woods. I already own Iris Silver Mist and 28 La Pausa, and this Bois d’Iris is quite different, well worth buying. Thanks for the review, I wouldn’t have sampled it otherwise! Finally tried this today! Alas, it’s so sheer and soft. As the fragrance wore on it actually reminded me of Jo Malone’s Vanilla & Anise, which I don’t like.